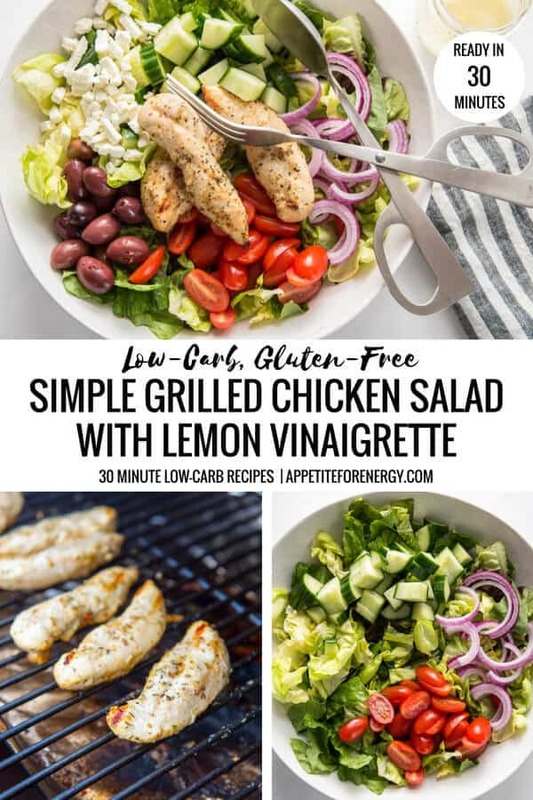 Simple Grilled Chicken Salad with zesty lemon vinaigrette is perfect for lazy summer days when you’re craving something, quick, healthy and delicious. It’s got all your favorite Mediterranean flavors including tomato, kalamata olives, feta cheese and refreshing cucumber. 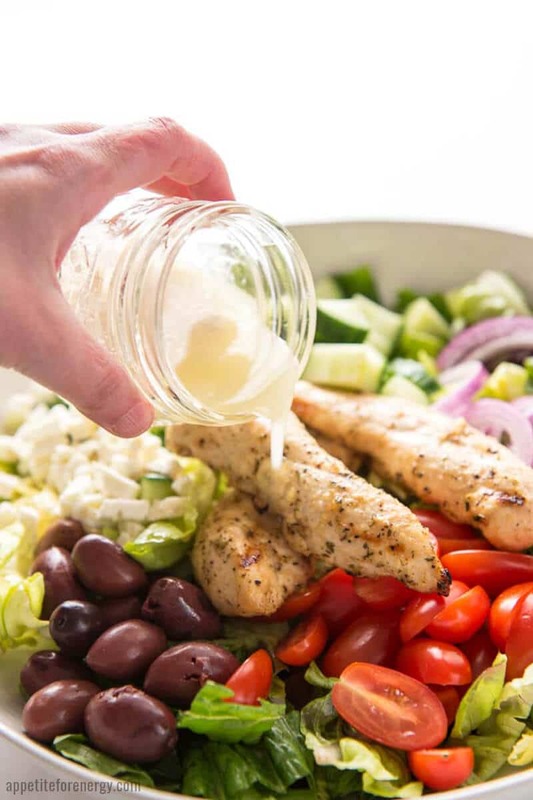 You can’t go wrong with a classic grilled chicken salad and this Greek herbed version with lemon vinaigrette is no exception. It’s just the recipe for those long, hot summer days when you don’t want to turn the oven on, but want a no-fuss dinner. 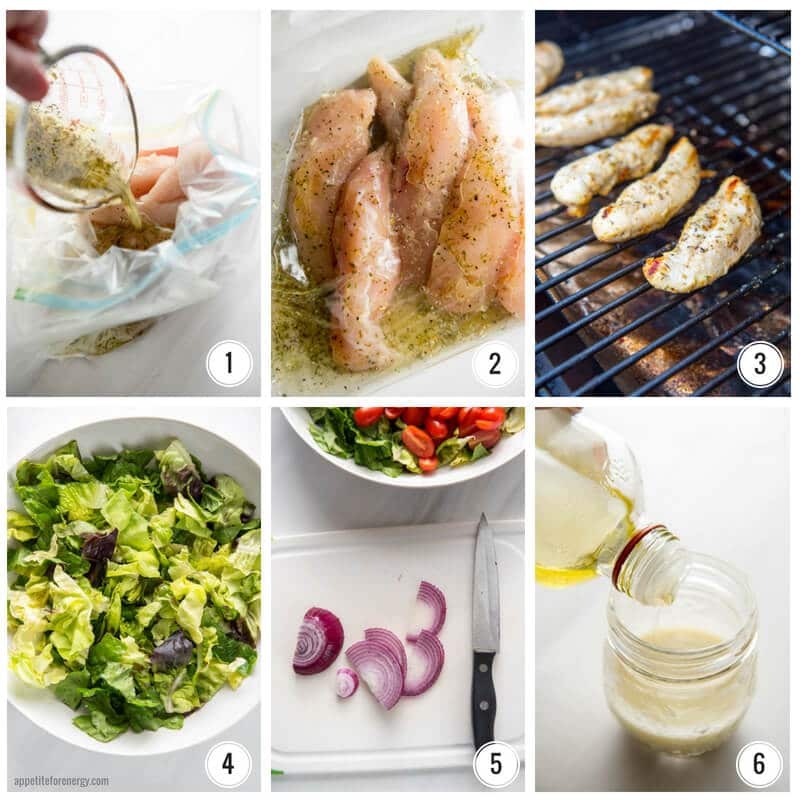 Fire up your grill and you’ll be serving this keto friendly chicken salad in 30-minutes. It comes together very quickly as you can prepare the salad and the lemon vinaigrette while the chicken is cooking. Here’s to effortless summer cooking! 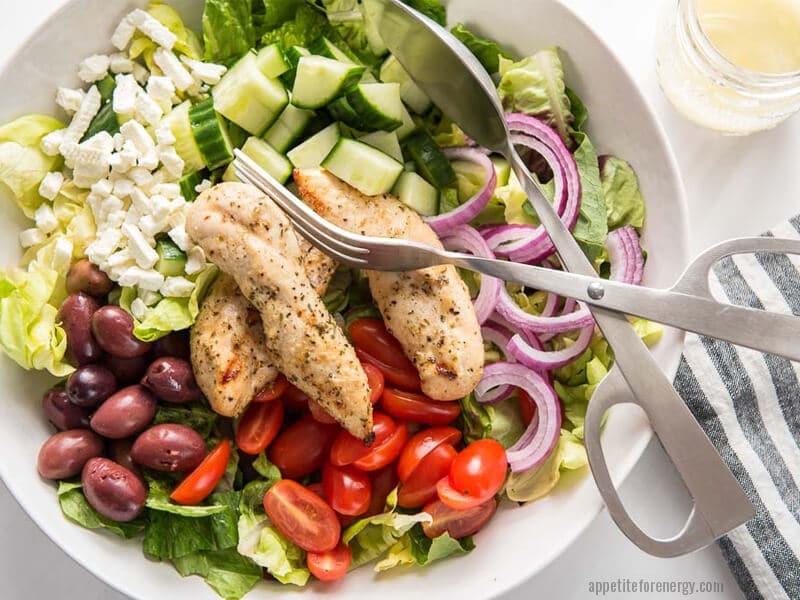 With plenty of olives and feta, this simple grilled greek chicken salad has a healthy quantity of good fats. 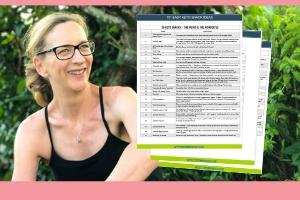 It’s ideal for low-carb, high-fat diets and is also gluten-free. How do I make a vinaigrette dressing? So, for example, one tablespoon of red wine vinegar (acid) mixed with 4 tablespoons of olive oil, salt & pepper. To make the vinaigrette, you need to create an emulsion which is where oil and vinegar are combined. This can be done by whisking, processing with a blender or shaking vigorously in a jar (my preferred method). The vinaigrette components will separate into layers again if left sitting for too long. If this happens before you’ve used the dressing, just shake or whisk again to re-combine. How do you make lemon vinaigrette? To make a lemon vinaigrette, mix lemon juice (the acid) with extra virgin olive oil. For the seasoning, stone ground mustard (or any mustard), sour cream and salt and pepper are added. Whisk, process with a blender or shake in a jar with the lid on tight. Once you discover how easy it is to make your own vinaigrette, there’s no going back to the store-bought stuff. 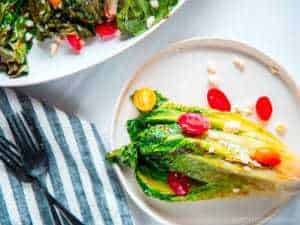 If you want more keto salad dressing ideas, check out 17 Keto Salad Dressings. What is in Greek seasoning mix? The herbs commonly used in Greek Seasoning are oregano, mint, garlic, onion, dill and bay laurel leaves. You may also find basil, thyme and fennel seed. Start by making the chicken marinade. Grab a Ziploc bag or suitable container and place the chicken inside. I used chicken tenderloins (breast) in this recipe. Add half the olive oil, 2 tablespoons of lemon juice and the Greek seasoning to a jug and mix. Pour over the chicken (image 1). The chicken can be marinated for several hours if time permits, otherwise just ensure that the chicken is well coated with the marinade before cooking. Get the grill fired up to 400°F (200°c) and remove chicken from marinade, discarding any remaining. Cook chicken on the grill or barbeque, turning once until internal temperature reaches 165°F (74°c). Slice the red onions and add to the salad, along with the tomatoes, olives and cucumbers. Crumble the feta over the salad. Make the lemon vinaigrette by whisking together 1/4 cup olive oil, 2 tablespoons of lemon juice, sour cream, mustard and salt & pepper. Allow chicken to cool slightly before adding to salad. Pour over the vinaigrette and toss well. I like to use a wireless thermometer and about 1/2 way through cooking I stick it into one of the average sized pieces of meat. This will alert you as soon as it is done so that you don’t overcook (or undercook) the meat. To prepare this recipe ahead of time, marinate the chicken earlier in the day, make the dressing and chop all the salad ingredients and place in a bowl. Then, all you need to do is grill the chicken, shake the lemon dressing up and toss it all together. Any leftover lemon vinaigrette can be kept for 3-5 days in the fridge. Shake in the jar or blend before using. Simple Grilled Chicken Salad is perfect for lazy summer days when you're craving something, quick, healthy and delicious. It's got all your favorite Mediterranean flavors including tomato, kalamata olives, refreshing cucumber and feta. 3. I like to use a wireless thermometer and about 1/2 way through cooking I stick it into one of the average sized pieces of meat. This will alert you as soon as it is done so that you don’t overcook (or undercook) the meat. 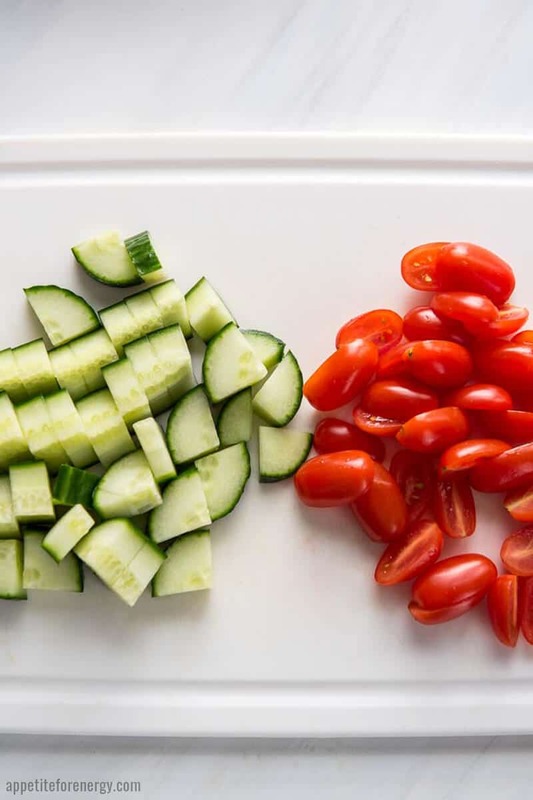 Looking for more 30-minute Summer Salads? 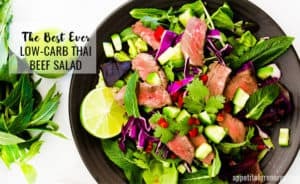 Try our all-time summer favorite Best Ever Low-Carb Thai Beef Salad. I recently started making my own salad dressing to avoid some of the additives in the store bought dressings. I love your vinaigrette and can’t wait to try it. Thanks for sharing! This sounds so refreshing and healthy!! I love adding chicken to my salad and making a meal for myself. The green makes it look so pretty too. A great recipe for summer! I need to get some of that greek seasoning for myself. I think the local spice shop has it, but I’ve never tried it. It sounds so delicious in a dressing with lemon and oil. The Greek Seasoning should be easy to find. Hope you like it! I genuinely love salads! And this dressing sounds delish. The pictures are just gorgeous, too! A simple chicken salad is on the of the best summer recipes. Lemon dressing is also a flavor because it’s so light and airy. This is a great flavor combo, and it looks beautiful! I agree – chicken salads are my go-to for summer! 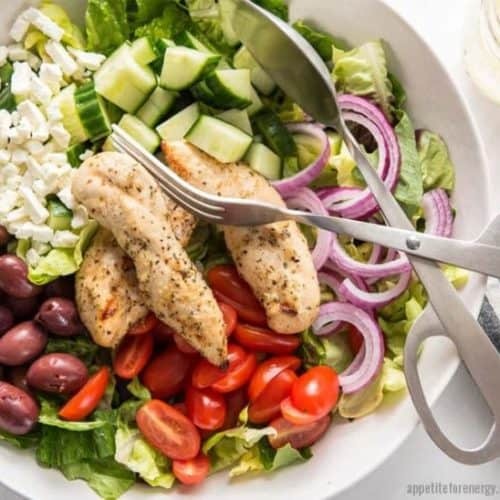 I am such a big fan of greek flavours….so a salad with greek chicken and feta in it. Well that is calling my name!!!! Chicken & feta are such a great combo – one of my faves too! This dressing sounds so good!Perfect recipe for summer. This looks perfect for a quick summer dinner, so refreshing! 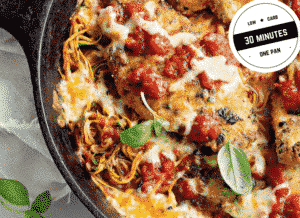 This is one of my favorite weeknight meals because it’s on the table in 30 minutes! So healthy, colorful and delicious. Perfect for summer. I hope you love it !! Oh I love this salad. It looks so fresh and crunchy and delicious. I love the dressing and all the flavors. Can’t wait to make this for me and my family.